Newly renovated lakefront cottage on Lake Joseph, Muskoka, Ontario is located 2 hours from Toronto near the town of Mactier. This cottage has been upgraded to preserve the Muskoka charm and tradition yet equipped with modern day comfort. On it's own point with 580 feet of gentle sloping frontage, you can fish right off your private point or sun bathe on the sandy beach area. The Cottage is SW facing with sun all day and the view of the lake is simply breath taking. There is fishing right off your private point and a great spot for canoeing and kayaking. 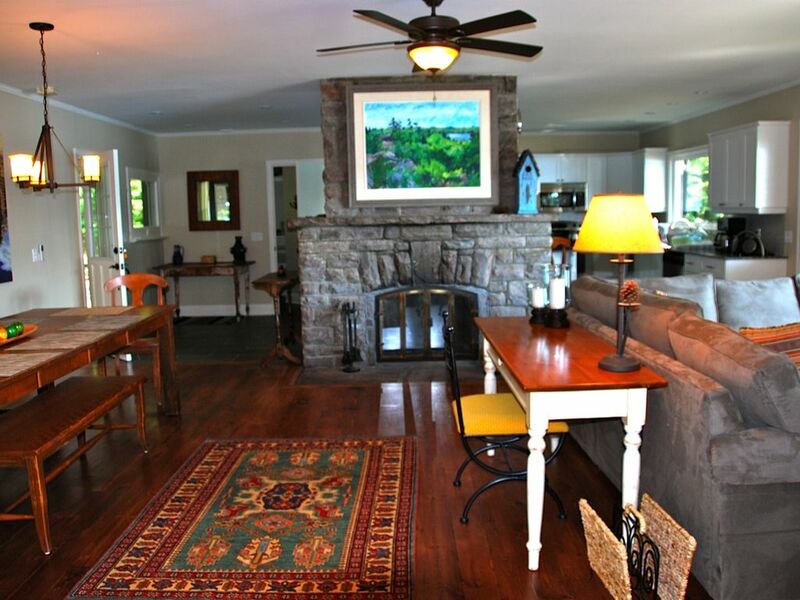 3 bedroom that sleeps 6 , kitchen, laundry room, living room, dining area, muskoka room. 1 bathroom. The cottage also comes with a 1 slip boathouse. Kayaks, paddle board and Canoe provided. * This is not a timeshare or an island guesthouse. Road access on your own property. Experience the true cottaging experience. * There is a glitch on the homeaway site, there is no internet on the property. Enjoy the fresh air. My husband and I have enjoyed Muskoka cottaging for more 20 years. We love it and treasure the times we have with family and friends. This cottage is beside ours and it is important for us that you enjoy the experience as much as we do. This property is the nicest piece of land on the entire strip. The cottage is SW facing and situated on a point ( that means you are surrounded by water). You can see the lake from the Muskoka room180 degrees, kitchen, living room, dinning room, guest room and Master bedroom. There is total privacy on 1.5 acres of land. The location is prime and only 2hrs from Toronto. Close to spa, golf courses, restaurants. The cottage has been gutted and newly renovated and decorated. It is your home away from home. 580 ft of gentle sloping granite frontage guarantees lots of water activities. Included in the rental are 2 kayaks, paddle board and a canoe. The cottage is decorated to reflect the Muskoka charm - new harvest table, granite counter top, new beds...etc. The Muskoka Room is a favorite for reading a book, arts and crafts or for family board games and cards. The fireplace is spectacular. It was originally built as an outside fireplace then the original owner built the cottage around it. At the point, there is a fire pit hand made from Cape Breton ( these fire pits were on the front page of the Cottage Life 20th anniversary edition) ....imagine making s'mores under the moonlight hovering the still lake at night. toilet, shower, Toto toilet, granite counter top vanity. 580 feet of gentle sloping frontage on Lake Joseph. Cottage is SW facing and 180 degree view of the lake. Comes with its own sand beach area, perfect for kids. Great for water activities. Located on a point of 580 feet of Frontage, you get 180 degree of the lake inside the cottage from the living room and muskoka room. 6 towels are provided and 6 beach towels to use on the dock. Salt, pepper. Brita water filter jug with new filter. Full kitchen with granite counter top. Seats 2 at the counter. Seats 8-10, Solid maple harvest table with benches and chairs. 10min from Rockycrest and 15min from Lake Joseph club ( Clublink course), public courses: the Rock, Woodland, Seguin. Private beach. Weekly or bi-weekly cleaning service can be arrange at additional cost. We spent 5 days with our son who was visiting from Edmonton. The cottage was most impressive and very well equipped . Even though we had hoped for warm sunny weather , we concluded that there was no better place in Muskoka to be than around the beautiful fireplace looking out the large window facing lake Joseph. When the sun finally appeared we enjoyed the spectacular colour of the fall leaves. Jacqui has done a superb job in creating a warm comfortable place to relax and enjoy our holiday. We all agreed that it would be a great place to return to in the summer and enjoy all the water activities available. If you are looking for a place right on the water with amazing views then you have to stay here. We loved it!! Jacqui and Brad have done an amazing job renovating the cottage. All the finishes are very high end while still keeping the warmth and feel of an original Muskoka cottage. It is very well maintained and has all the amenities you could possibly ask for. The point is very private, great views and you are able to enjoy the sun anytime of the day. It is the perfect spot for swimming, kayaking or paddle boarding, all of which we enjoyed immensely. Our hosts were very friendly and helpful and we thoroughly enjoyed our stay, we really didn't want to leave. Hope to return next year. My husband, 13 year old niece and I enjoyed a glorious fall weekend here. The cottage is beautifully appointed, modern with old style charm and all the creature comforts we needed, including plenty of kitchen tools for cooking indoor and out as well as relaxing. The water was cool so we didn't take advantage of the water toys but the view on the point was breathtaking on the spacious private property and the weather was warm enough to enjoy a swing on the hammock, a seat next to the boathouse, the sun and the sound of the birds and lapping water. Inside we enjoyed the roaring fireplace, cozy couch, comfortable beds and cottage games in the Muskoka room. Jacqueline was a helpful and attentive host and was in touch throughout to make sure all our needs were met. The sunrise and sunset were sensational. We hope to come back again! Jacqui and Brad have done a terrific job with this cottage. It is basically brand new but has a great rustic feel, especially the stone fireplace and some little touches like hooks to keep the windows open. The cottage was spotless when we arrived, the kitchen was well stocked and the BBQ worked well. The bed was very comfortable. The dock has great southern exposure, so you'll be in the sun pretty much all day. Jacqui was very helpful, answering questions and providing us with some extra kindling (we were there for a long weekend in the fall and had a fire every night). The only reason we can't give it 5 stars was traffic noise from a nearby road and the noise from trains that woke us up in middle of the night. Overall though we were very pleased with the cottage and Jacqui's hospitality. This is the perfect cottage for the summer and fall Muskoka experience. The cottage has been newly renovated to preserve the muskoka charm with upgraded modern facilities. Canoe and kayak right off your dock. Water ski instructors can be arranged to come to your cottage to teach the family. You can boat to Lake Joseph club for a lunch/dinner or meet friends on the lake. Enjoy the charm and magic of being on Lake Joseph. This is how memories are created. If you are looking for 2 day rentals during the shoulder season, it is available at a small premium to cover part of the cleaning fee.